Here at Artificial Style, we only bring you the highest quality landscaping supplies and services possible. That is why we’ve chosen SAiGE Longlife Decking as our main composite decking supplier. The information below will show why SAiGE Longlife Decking sets the benchmark for quality, excellence, and practicality. Longer Lifespan The name says it all! With an expected lifespan of 25 years, your composite decking will stand the test of time. SAiGE Longlife Decking also provides a 10-year full manufacturer’s warranty. 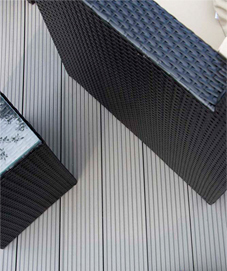 SAiGE composite decking is anti-splinter, free of toxic additives, and heat resistant. Your children won’t hurt themselves on fixings because the SAiGE composite decking has a hidden fixing system. 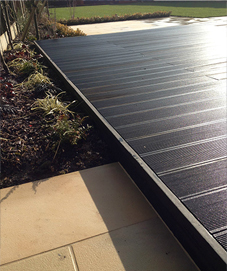 SAiGE composite decking also contributes to the care of the environment as it is made from recycled materials. Better than Wood Decking Aside from having a longer lifespan, composite decking vastly out performs wood decking in various aspects. It maintains a wood-like appearance but continues to eliminate warping, splitting and rotting. Composite decking is also resistant to insect and woodworm attacks. Compared to conventional lumber, it also has radically lower fungi and mould development. It is also highly durable as it only has 0.5% water absorption rate, whereas with wood, it can be up to 100%. Low Maintenance Here at Artificial Style, we always make sure that we bring convenience to our clients. That’s why we highly recommend composite decking. Once we’ve installed it, you’ll have a virtually maintenance free decking. You don’t have to paint, sand or seal your composite decking each year because its colour, quality, and texture are consistent.